We welcome YOU to experience our "Oasis of calm in the Center of Ubud"
As a center dedicated to healing and renewal, The Yoga Barn provides a lush and inspiring environment for the nourishment of body, mind and soul for all members of the Bali community. Whether you are a traveler looking to drop in once, an Ubud local wanting to practice regularly or a teacher interested to bring a group to our enchanted oasis, we welcome you to join the Yoga Barn extended family! Featuring over 15 classes a day to choose from, the programming team at The Yoga Barn has created a diverse schedule of the highest quality, taught with the deep knowledge and large hearts of the studio's faculty. 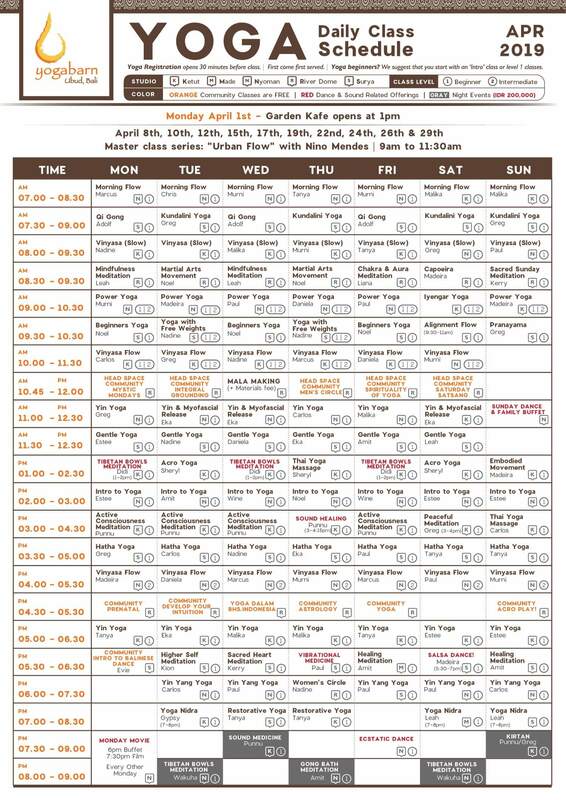 The mosaic of daily classes and workshops include Yin, Acro, Classical Hatha, Vinyasa Flow, Power, Yoga with Weights, Iyengar, Anusara Inspired, Tai Chi, and for those who are looking for relaxation, there is Gong Bath, Tibetan Bowls, Sound Healing, Restorative Yoga, Pranayama, Meditation and more. Other amazing weekly activities include the Monday Night Movies (bi-weekly), Sunday’s Ecstatic Dance, followed by an incredible buffet in the Garden Kafe and Sunday Evening Kirtan (call and response chanting). Classes are mostly Open Level, unless labelled otherwise on the schedule (Look for notations: Level 1 (All Levels/Beginner), Level 1/2 (Intermediate) or Level 2 (Advanced). Classes fill up quickly, especially during the busy season. Registration opens 30 minutes before class, first come first serve. Ecstatic Dance and Tibetan Bowl registration opens 1 hour before class. Class Cards are offered in denominations of 3, 5, 10, 20 classes, and 30 Day Unlimited only. The price per class descends on a sliding scale depending on how many classes you purchase. Please note that there are donation based community classes for those on a budget. Class cards are valid from 6months from date of purchase and are non-extendable. Class Cards are registered in the name of ONE individual only (the person purchasing the class card). As long as the person on the name of the card is attending a particular class he/she may share the card with any accompanying guests. A special Bali Expat Discount is available to Expats who live in Bali and can produce a Valid Kitas registered in Bali (not in other areas of Indonesia) ID IS REQUIRED. Balinese locals who can produce a valid Bali Based KTP are welcome to join any class by donation (KTPS must have been issued in Bali, not other islands in Indonesia). Students between 12-16 years (ID may be required) can purchase class cards with a 50% discount. We understand that occasionally classes may not be quite what you expect. If you leave a class within the first 15 minutes and report immediately to reception you will be refunded for that class. Any later than 15 minutes, there will be no refund. Yoga Barn Class Cards are non-refundable, non-extendable and non-transferrable. You cannot transfer your card to another person after leaving Bali. Please purchase the class card denomination that best suits the time you will be spending in Bali. We do not offer advance booking or reservations for daily classes with the exception of Ecstatic Dance. 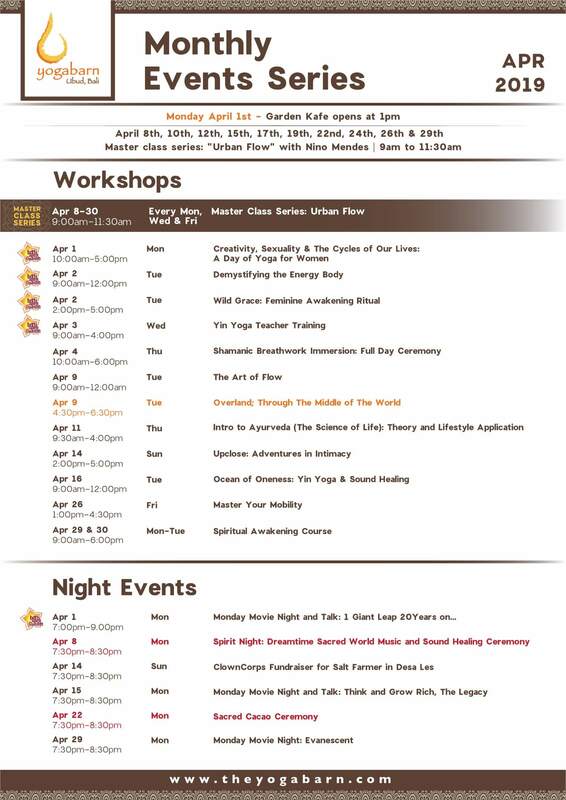 For daytime classes, registration opens 30 minutes before the start of the class. For nighttime events (starting 7:30pm or 8pm) registration opens 1 hour before the start of the event. These are very popular so if you want to be sure to get a spot, book online here or arrive at the time when registration opens. Once you are registered, you can grab a fresh juice from our Juice Bar or relax in our garden space. The schedule below and on the app is for information purposes and remains subject to change. You can find out description and pricing information for our monthly workshops and events here or learn more about some of our special classes here. Upon receiving your booking request, to confirm we require a 50% non-refundable deposit to secure your booking. This will be deducted from your final payment to be made before your yoga class. Every Friday and Sunday at The Yoga Barn we host a community Dance. A space for our conscious community to connect and dance, to let loose and shake off anything that no longer serves them. Guided by eclectic DJ’s and live music the body and mind become absorbed in the beats of the music and free-form movement is used to release energetic blockages, increase body awareness, deepen the breath, de-stress and feel connected to yourself. And to have fun! Both our Friday Ecstatic and Sunday Dances are very popular and always sell out. For each Dance there is a maximum capacity of 150 dancers so it is important to get your ticket in advance. Kindly note: begging, pleading, bribing, being nasty or unkind with our Dance Angels won’t get you anywhere…! We offer an online registration system for our Friday Ecstatic and Sunday Dances with the purchase of a 3-Dance Pass. The pass can be purchased from our Upper Reception only. The quantity of available 3-Dance Passes is limited to 55 active passes; and once sold out, they are sold out. Visit our Upper Reception to buy your pass. A 3-Class Dance Pass is Rp. 390,000 and valid for 30 days. Once you have purchased your 3-Class Dance Pass register online using our simple step-by-step guide. Registration is open 24 hours before the Dance and closes 3 hours before each Dance starts. On the day of the Dance collect your wristband from our Upper Reception. Your wristband is available for collection 2 hours before the Dance starts. Dance, like you’ve never danced before! Arrive early to The Yoga Barn to join the dance queue at our Amphitheatre and get a number card**. Meet fellow dancers and reserve your spot. Number cards are handed out 2 hours before the start time of each dance. Hang out, grab a juice, a coconut or head for some nourishment at the Garden Kafe or head home and rest-up before you dance. 1 hour before the Dance bring your number card** to Lower Reception Desk to purchase your dance ticket and receive your wristband. What is an Ecstatic Dance? Ecstatic Dance is a party. A bringing together of bodies from all over the world to dance, feel free and get out of their busy minds. The concept was born in the 2000's in Hawaii by founder Max Fathom, who was inspired by a concept called 'Body Choir', originally created in the 90`s in Texas and has been a popular event at The Yoga Barn for many years. This style of Dance takes provides a feeling of freedom through physical expression, guided only by eclectic DJ's and live music. There are no judgements, no comparisons, and certainly no drugs, alcohol or talking. But there is certainly a lot of sweat. - They are simple, yet very different from a regular party. Please respect the space of other Dancers. Please remember that everyone is attending for their own dancing journey – they may not appreciate contact dance. Registration 24 hours before the dance starts. Friday Ecstatic Dance: Online Registration opens from 00:01 on Thursday until 16:30 on Friday. Sunday Dance: Online Registration opens from 00:01 Saturday until 08:00 on Sunday. Instructions will be given for online registration procedures with the purchase of your 3- Class Dance Card and can be seen here (link). Any Dance reserved with the 3-Class Dance Pass and not cancelled before online registration closes will be charged to the card. We are unable to refund a dance class after online registration has closed. Number cards are not dance tickets. You still need to exchange your number card at Lower Reception up to 1-hour before the dance starts to purchase your dance ticket and receive your dance wristband. You cannot buy a dance ticket (wristband) without a number card. We are not responsible for lost number cards. A number card must be converted to a dance ticket (wristband) BEFORE the start time of the dance. A number card is NOT VALID and CANNOT to be converted to a dance ticket AFTER the start time of the dance. We hold the right to sell unclaimed dance tickets for any late or no-show number card holders to guests on the waitlist. New to yoga or thinking about starting yoga? Etiquette is at the heart of a yoga practice and it is best to know this sooner rather than later to gain respect of your fellow yogis and teachers. Our rules might sacrifice individual needs on occasion, but have been created for the comfort of the larger group. The Yoga Barn apologizes for any inconveniences that our Guidelines may cause you. Class registration is on a first-come, first-serve basis and takes place in the Lower Reception. At this time, you cannot pre-pay or pre-book classes. Each class is 1 hour and 30 minutes duration, unless otherwise noted. Classes are mostly Open Level, unless labelled otherwise on the schedule (Look for notations: Level 1 (All Levels/Beginner), Level 1 and 2 (Intermediate) or Level 2 (Advanced). Classes fill up quickly, especially during the busy season. Registration opens 30 minutes before daytime classes and 1 hour before for evening classes (those starting at 7:30pm or 8pm). Ecstatic Dance and Sunday Dance are our most popular classes and have special registration rules, see here. Yoga mats & props are provided, but feel free to bring your own. Each Studio/Class has a Maximum Number of participants allowed in the room, once registration hits that maximum the class is considered full. There are NO EXCEPTIONS, we will not squeeze another person in the room, it becomes uncomfortable for the group as a whole. Classes Entrance is closed 10 minutes after the scheduled start time. Exception: Yoga Nidra class is closed for registration and entry 5 minutes after the class start. For daily classes, Children under the age of 12 are not permitted to join classes, there are NO EXCEPTIONS to this rule unless otherwise stated on the schedule as ‘Child Friendly’. Sunday’s Ecstatic Dance and Kirtan are family friendly, so come one, come all! With the exception of the Yoga Barn Menagerie, no pets are allowed in classes. Practice Patience and Kindness at the Registration Desk. Have Respect for The Yoga Barn staff and understand how hard it is to manage hundreds of Yogis trying to get into class on time. Everyone is doing their best. 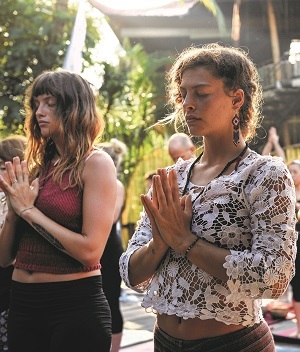 Dress Appropriately for class and for walking in the streets of Ubud. Remember you are in Bali, a slightly more conservative Hindu culture that prefers modesty in the form of covered elbows, shoulders and thighs. This applies to both men and women. We have changing rooms for this purpose. Be Punctual. Come 15 minutes before class and settle into the room quietly, it is a sanctuary for the duration of your class. If you are late but there is space available, you can register and enter a class up to 10 minutes after the published class start time. Exception: Yoga Nidra class is closed for registration and entry 5 minutes after the class start. Respect the teacher and your neighbors, please practice as instructed by the teacher and do not practice your own series during class. Consider your neighbors on the mat next to you and make sure that you are fresh and clean and not wearing cologne or perfume. Many people can not handle strong scents, so naturally clean and fresh is best. Showers are located on site and towels are available for rent. Absolutely NO SELFIES or PHOTOS during class! Please turn off your cell phone or at least put it on silent before the first OM. If exiting early, please do so just before Savasana, not during. Figure out the best way to leave your space silently. If you have no other option, leave your mat and props where they are (do not open the cabinets) and quietly leave with respect to the group. Practice GRATITUDE. Whether you enjoyed the class you took or felt it was not your style, please know that The Yoga Barn staff and faculty gives 100% of themselves to provide you with the best experience possible. Many years of personal study has prepared our faculty to teach, and hours of prep goes into each class taught. There is a teacher for everybody and we hope that the Yoga Barn provided you with what you need for now. We appreciate any class feedback you want to share here. All of our classes are taught with love, passion and dedication from our incredible faculty of diverse teachers. We hope you have a heart-opening, mind-expanding and friendship-sharing experience with us.